Preview and print this free printable artist biography by clicking on the orange button. Piet Mondrian was born in Amersfoort in the Netherlands, in 1872. He was the second of his parent's children. At a very young age his father Pieter and his Uncle Fritz, both artists themselves, introduced Piet to the world of art. In 1892, Mondrian entered the Academy for Fine Art in Amsterdam as a qualified teacher. While teaching at the academy he also practiced his painting. Most of his paintings from this period were of landscapes. These pastoral images of Holland included fields, cows and windmills. These paintings were representational, and show the influence that the pointillist (painting with dots) and fauvist (vivid colors) movements had on him. While Mondrian's early works represented the world he saw around him, his discovery of Cubism in 1911 guided him toward pure abstraction. Paintings such as The Sea (1912) while still somewhat representational, began to be dominated by the geometric shapes of Cubism. Mondrian eagerly absorbed the Cubist style, though he seemed to know that this was only a stepping stone on his way to finding his own unique style. 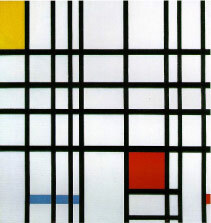 Mondrian continued to explore abstract forms eventually developing a style of painting he called neo-plasticism. Mondrian returned to Paris when the war ended. It was there that he painted one of his most famous paintings, Composition with Red, Yellow and Blue (1921), a painting composed of rectangles with primary colors on a grid of black lines. In the years that followed, he continued to eliminate "non-essentials", limiting his works to these "basic forms of beauty." 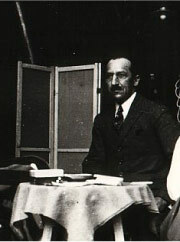 Piet Mondrian died of pneumonia in New York City on Feb. 1, 1944. His paintings became so famous in the decades that followed that other painters, advertisers, architects, graphic designers, and even high fashion clothing designers around the world copied his distinctive style.